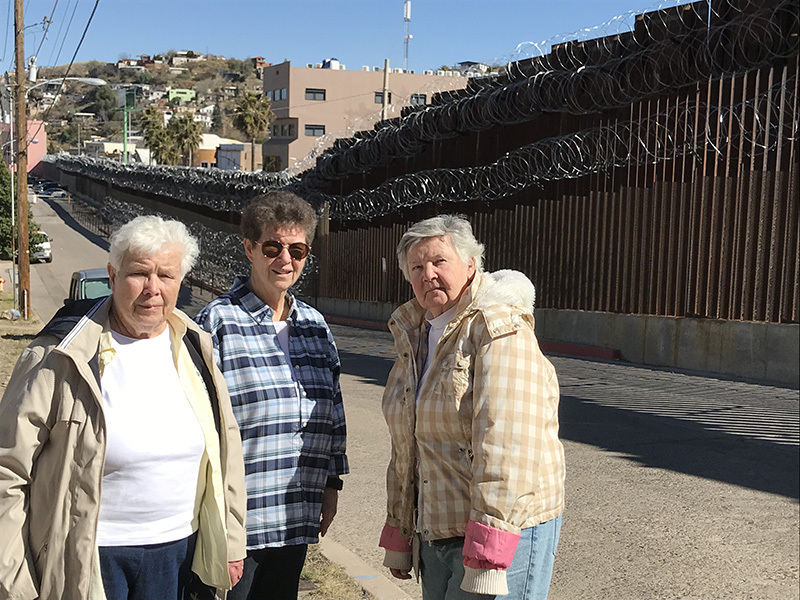 On February 13, 2019, Sisters Pat Stringer, Mary Pat Reid and I set out for Tucson, Arizona, to assist newly-arrived migrants at our southern border. We were uncertain as to the specific jobs we would be doing once we arrived, but that did not matter to us. Sister Pat wanted to see firsthand the situation at the border and be able to speak truth about what is occurring. I welcomed the opportunity to work with other Dominican sisters while aiding migrants. 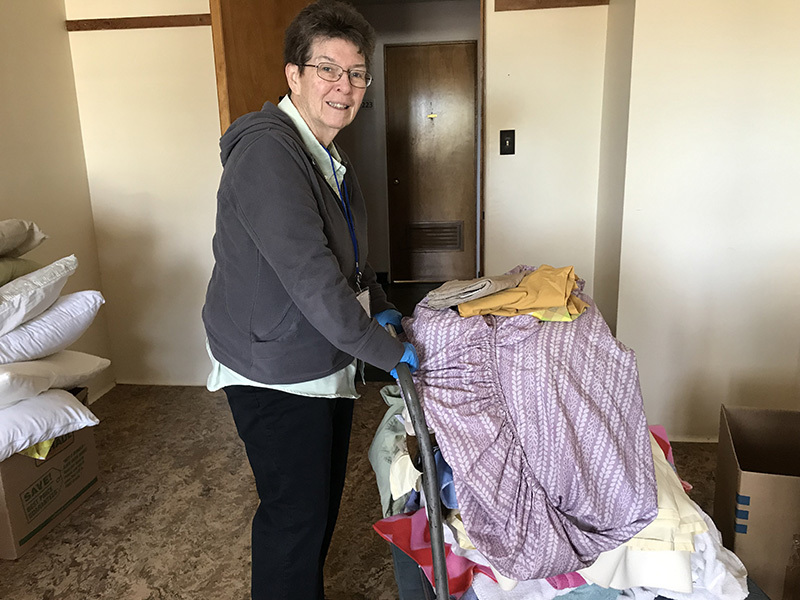 Likewise, Sister Mary Pat wanted to find those who needed help and give it to them while she still had the ability to do so. Sister Angélica Vélez, OP, a Dominican Sister of Mission San Jose, coordinated our efforts to volunteer at Casa Alitas, a migrant hospitality center under the auspices of Catholic Community Services of Southern Arizona. Located in a former Benedictine monastery, this property was sold to a developer who has given the Diocese of Tucson the use of it until the end of May. We are thankful that the developer has allowed the building to be used as a humanitarian center while details of the development are finalized. Most migrants stay only one night at the monastery, but there is a constant flow of taking in guests from the detention centers and sending them onward to their sponsors. Once the immigrants are cleared by Immigration and Customs Enforcement (ICE), they have permission to be in our country but must appear before an immigration judge when they get to their new destination. This date is preset before they come to the monastery. Being a sponsor for a new arrival is a quite a commitment, including being responsible for all of the migrant’s bills—even medical bills should surgery be needed. 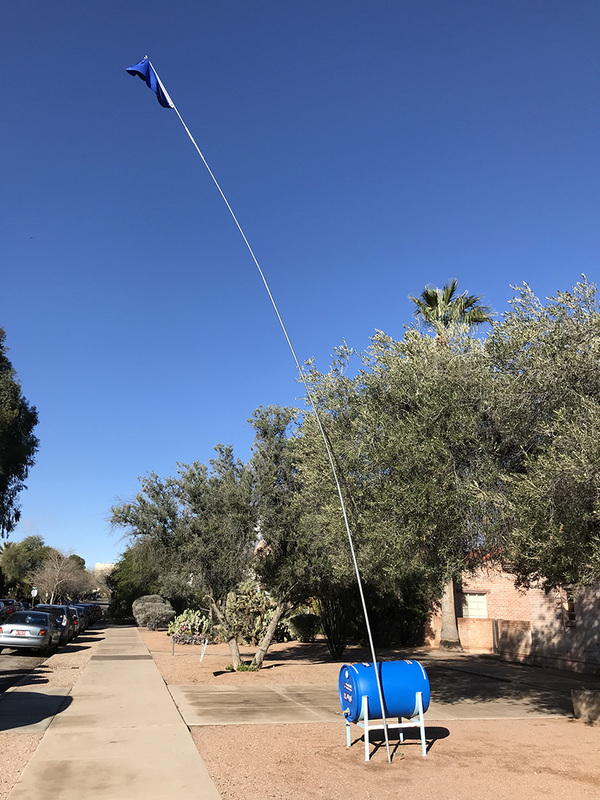 Over the course of our ten days in Tucson, we “pitched in” wherever needed making breakfast and serving food, washing and folding laundry, sorting clothes, undertaking supply runs to Costco, and more. One day, we packed backpacks and bags of supplies the migrants receive for their journeys to their sponsors’ locations. Some travel two or three days to their final destinations and we met families going to California, Texas, Kansas and New York. Another day, we made peanut butter and jelly sandwiches and salsa. Lots of salsa! 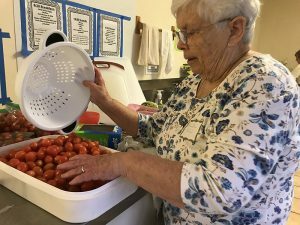 Sister Mary Pat was put to work cutting up onions, potatoes, tomatoes and cabbage. Sister Pat and I packed individual servings of carrots and tomatoes, part of the food packages that also include drinks, sandwiches, hard boil eggs, and fruit. For a typical lunch, we had sixty to one hundred guests to feed. New arrivals must complete an intake process, and Sister Pat used her Spanish skills to help with this task. These new arrivals are always seen by a medical doctor or nurse, and all children are given flu shots. Thankfully, volunteer nurses frequently work at the center via a nurses’ outreach program for humanitarian crises. After completing the intake process, the migrants are invited to choose clothing for the next steps in their journeys. I met one young man scheduled to have his court hearing with an immigration judge in Tucson because ICE could not reach his sponsor. He had to stay at the monastery until his court date. He shared with Sister Mary Pat that he fled Honduras because of gangs. An immigration lawyer from the Florence Project, which does pro bono work, was to represent him in court. Sister Mary Pat, one of our congregation’s artists, was grateful to be able to help in the art room one afternoon. There she met Jarddin, Jesenia, and Iamai, ages 12, 10, and 8 respectively. Jarddin drew a picture of the Lion King. Jesenia learned how to draw faces, and Iamai, a drawing of the monastery and herself dancing outside. Sister Mary Pat experienced the love of these children and helped these young guests discover new talents. We were so impressed by the variety of helpers at Casa Alitas. One woman was in Tucson with her husband, who was attending a convention. She heard about Casa Alitas and, instead of going to a day spa while her husband was at his meetings, volunteered for the day at the center. A resilient husband-and-wife team, Frank and Dale, also comes almost every day to help with the laundry—a big undertaking for only two people. Another group helps sorting clothes, and yet another serves soup to new arrivals. We met a young woman from the neighborhood dropping in to help because she had just heard about the need for volunteers. That same day, a group of students from a local Catholic high school Spanish class coming with supplies. We also met neighborhood people answering a local listserve call for aid by bringing in toilet paper and spaghetti sauce. Tucson, as a community, is seems united in helping with the present situation. Most of each day’s new arrivals were from Honduras or Guatemala. Over our ten-day visit, we observed several reunions of families who had been separated at detention centers. We were particularly moved by an Honduran father and his daughter who came to Casa Alitas while his wife and second daughter were still detained. The joy we witnessed when they were reunited! He and his family left for Brooklyn, New York shortly thereafter. 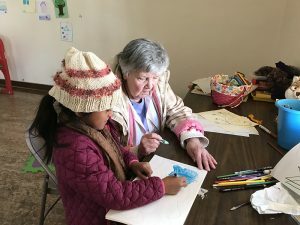 When buses with new migrants arrived, Sisters Pat and Mary Pat witnessed how those already present looked out the monastery’s windows in silence, hoping to glimpse their loved ones. One woman came running down the stairs crying to greet her sister. Another joyous reunion! Sister Pat and I also met a young mother with her daughter who told us that they were in the detention center for five days before coming to the monastery. They were only given water and a package of peanut butter crackers to eat three times a day. We also met a man who had his four-year-old son with him but was separated from his wife and eight-year-old son. The father and boy waited at the monastery for a few days, but, sadly, we do not know whether this family reunited. While helping with the laundry, we had time to talk at length with Frank and Dale, discussing the different groups trying to help migrants in the Arizona desert. 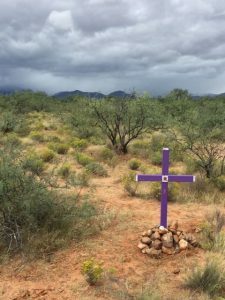 Frank told us about the 800 crosses that have been placed in the desert where more than 3,000 sites of remains have been found since 2000. 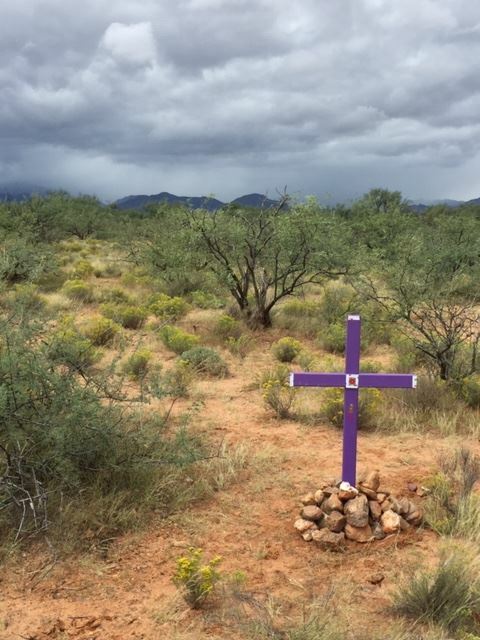 The crosses are made each week from the metal of migrant artifacts, such as tuna cans, etc., found in the desert. A red dot placed in the center of each cross corresponds to a matching red dot plotted on the death maps maintained by the Pima County Medical Examiner. There are three groups working to help the migrants. The Samaritan group puts the crosses in the desert and gallon jugs of water. The Humane Borders group, which has government permits to drive trucks into the desert, places large blue barrels in the desert with a picture of Our Lady of Guadalupe on the front and a flag to show that the water is safe to drink. You can read more about this group on their website: https://humaneborders.org/. The third group is more of a political group, No More Deaths. Frank also told us about an anti-immigration group shooting holes in the barrels to drain the water out. So many different faith groups are providing humanitarian assistance as well. One longtime advocate is a retired Presbyterian minister, Rev. John Fife, who is a co-founder of the No More Deaths immigrant rights group. He also co-founded the Sanctuary Movement when he made Southside Presbyterian Church in Tucson a sanctuary church in 1982. On the way to the monastery one day, we visited Grace St. Paul’s Episcopal Church, which has a blue water barrel and flag outside along with this sign: “Humanitarian Aid is Never a Crime — Drop the Charges.” This sign is the result of people being arrested for littering because they placed water in the desert for immigrants. The sign on the outside of the church reads, “Immigrants and Refugees Welcome.” All the churches here are so involved with helping the immigrants. At the monastery, we also met Louise Shelby, the coordinator for migrant ministry from St. Pius Church. Their church had housed immigrants every third week; however, since the monastery opened, St. Pius Church closed its hospitality center. Volunteers from St. Pius now help at the monastery instead. We also heard about Saint Mark’s Church, which houses twenty migrant families at a time, and Merilac House, all doing this same kind of work. To get a full picture of the border situation, we were able to travel to Nogales, Mexico. 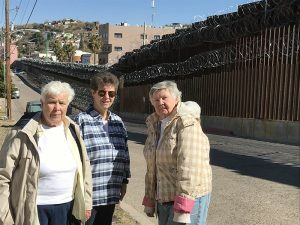 Mission San Jose Dominican Sisters Angélica Vélez, OP, and Mary Virginia Leach, OP, both in ministry at the St. Thomas More Catholic Newman Center at the University of Arizona, drove us an hour and forty minutes to the border. On the way, Angélica discussed aspects of the various humanitarian groups, particularly the Samaritan group, who go out to put water bottles and food along the migrant trails, often in extreme heat. The Samaritans are subdivided into the Buffalo group and the Turtle group. Each group has the same job with respect to putting out water and food, but, as you can figure out, the Turtle group walks much slower than the Buffalo group. We all decided we belong to the Turtle group! Nurses and doctors also go out on the trails. If they meet migrants, they can feed them and take care of their medical needs. However, it is illegal to drive them anywhere unless it was a life-or-death situation. We parked our van in Nogales, USA, and walked about a mile and a half to Nogales, Mexico. We then walked to the El Comedor (which means ‘dining room’), an outreach center sponsored by the Jesuits and part of the Kino Border Initiative (www.kinoborderinitiative.org). The storefront location has about fourteen tables, and breakfast and lunch are served. Again, volunteers are the lifeblood of the effort. We met a husband and wife who rent a small apartment in Mexico for six months and come five days a week to serve breakfast. Another volunteer, who is part of the No More Deaths project, is a former high school ESL teacher. She quit her job and needed to spread her wings. She stays at a bed and breakfast in Nogales, USA, and walks across the border five days a week to volunteer at the El Comedor. We met another group that drove in from Phoenix, Arizona, to serve breakfast. Like at the monastery, they have a small clothing center and a person to help with small medical needs. The migrants at this center are either in the process of seeking asylum or have been deported back to Mexico. We crossed back over to the United States and stopped was at the Mariposa Port of Entry. Sisters Angélica and Mary Virginia were shocked to see how much razor concertina wire had been put up since their last visit. All we could do was pray for these people. We are most grateful to the Sisters of Charity from Seton Hill, Pennsylvania, specifically Sister Jeanne, the delegate for religious, Sister Claudia, and Sister Hae Roc, who were our hosts at Saints Peter and Paul Convent. 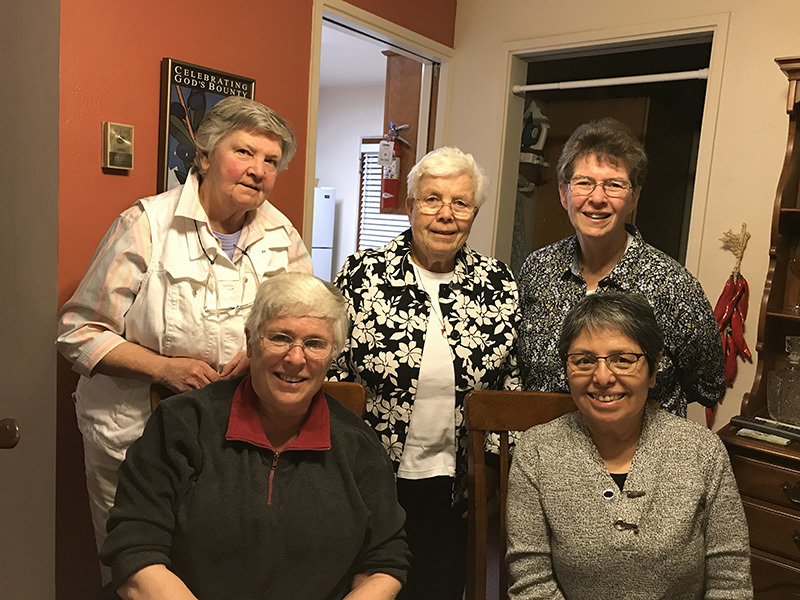 We are also forever grateful to our Dominican Sisters of Mission San Jose, Sisters Angélica and Mary Virginia, who made all of the arrangements for our hospitality and transportation back and forth each day to the monastery as well as for our side trips. 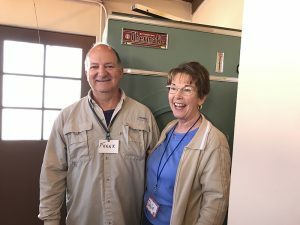 As we left Tucson, it was difficult saying goodbye to all the great volunteers we met at the monastery, but, in a sense, we were also migrants for ten days. We journeyed to Tucson looking for truth and hoping to be of assistance; we returned home enriched by the people with which we shared life. Our hands were busy, and our hearts were as well.